Isle of Man cyclist Mark Christian has claimed the Isle of Man's first medal at the Commonwealth Games in Delhi. The 20-year-old from Douglas won the bronze medal in the 40km (120 lap) points race at the Indira Gandhi Sports Complex on Wednesday. The Under-23 British Cycling Academy rider gave a mature performance and was involved in several of the key sprints. The gold medal was won by Cameron Meyer from Australia with England's George Atkins taking the silver. Speaking after the race Christian said: "I'm over the moon. It's a magical experience to be part of the Commonwealth Games. "To come here and win a medal feels amazing." Assistant Team Manager Steve Partington said: "Mark picked up a bronze in the National Championships in Manchester last week, and to see him get a medal here is fantastic. 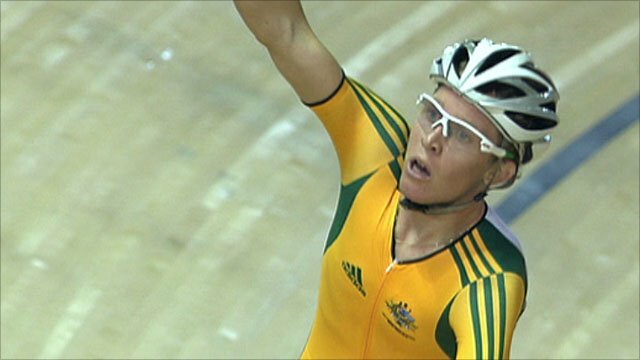 "He picked up some early points and was fighting it out for bronze with the Welsh rider over the last 20 laps. "It was only in the final sprint that he clinched it. It was very close." Fellow Manxman Chris Whorrall did not finish the final. "I think Chris sacrificed his race to help Mark. That's just the nature of cycling. One day he might repay the favour," added Partington. Why are there so few Asians in British athletics?